Watch out, The Xmas is about! EvaThemes had prepared some cool and EXTREMELY DISCOUNTED WP-Themes!! Check them up and try them on!!! 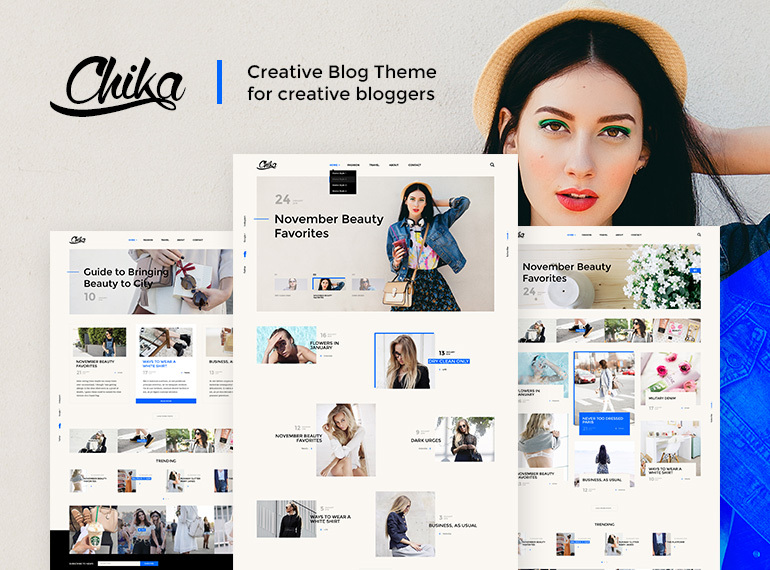 Chika is a nifty WP-theme that will surely fit the needs of true-bloggers, photographers and travelers that appreciate stylish design. It has different layouts that can be easily activated to boost the functionality of your blog. Feature images can be displayed in various combinations: chess-style, top-image, metro, card-style and even as a background image. Social media icons are placed both on the left and the right side in a harmonious ensemble of style. Chika template is calm and thus your content won’t be shaded by its’ elements. Watch & Buy at $29! 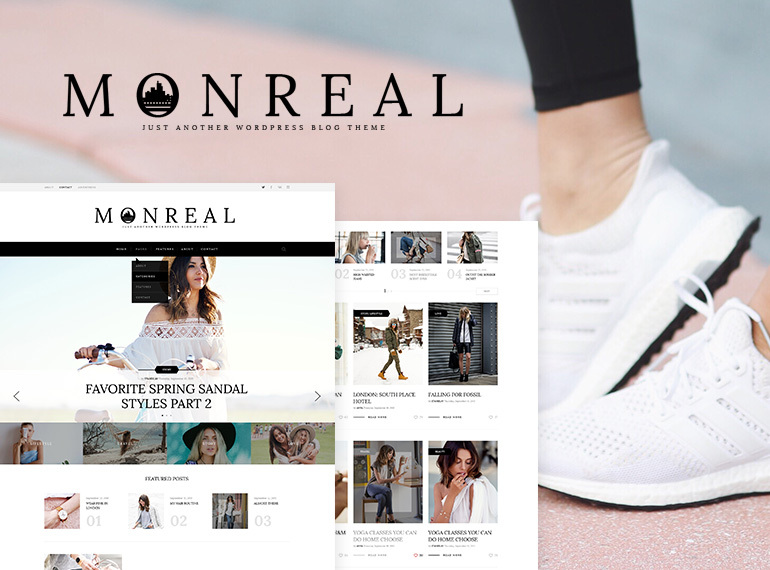 Monreal is an elaborated (+clean) responsive WP template with numerous great layout options and features. You can easily change up to 5 versions of Monreal theme. 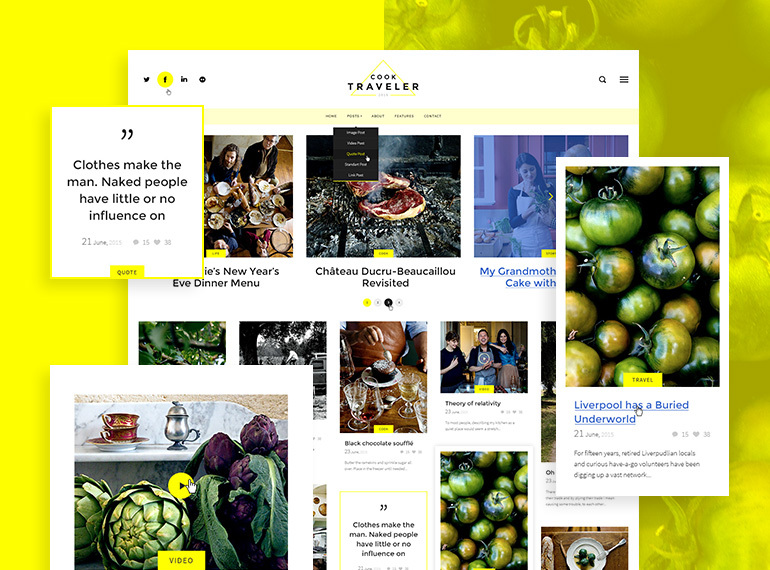 This theme was created to unwrap the (1) travel- (2) food- (3) photo- (4) wedding- or (5) building blog as quickly as possible. The offered layouts perfectly fit the demands of every topic, but still you are free to use them as you wish. There’s no criminality in adding food selfies into a “building” layout. One of the best features of Monreal WP-theme is that you can tune Homepage at your own discretion. Avantura is a powerful easy-to-configure WordPress theme that perfectly suits both personal blogs and king-size web-magazines. 11 featured layouts + 1 default – you’ll never stop giving rein to your imagination while filling it with texts and images. The main trump of Avantura WP-template is its broadness: there are dozens of embodiments when using every line-up of elements. You can change the façade of your web-site any minute on your mood. That’s why an Xmas discount for Avantura theme for WordPress is in fact the real magic! 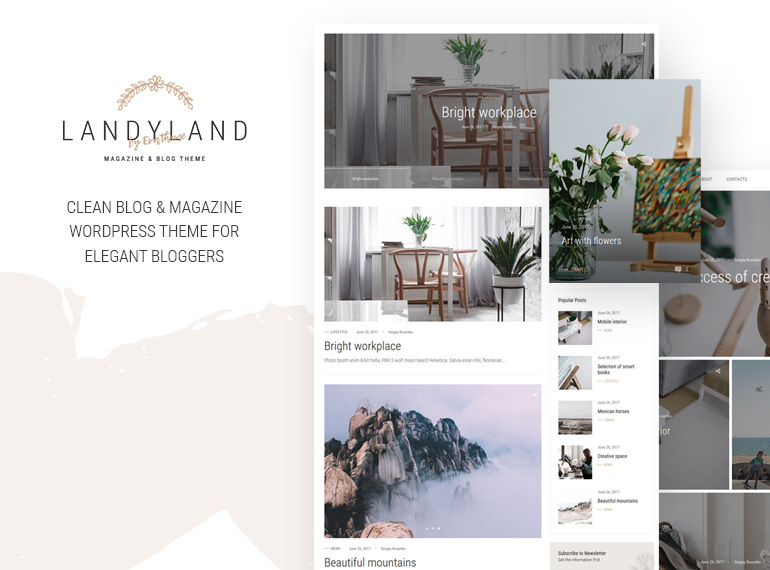 Landyland is a clean and elegant template to create a refined blog. Calm tones of a responsive design make it multipurpose. This theme uses narrow images for a better view on tablets and compact laptops. Plus carousel can be integrated for any category expanding the outfit of the blog. Place your photo to introduce yourself for your readers and subscribers – there’s a tiny ad hoc block for it! 5. Fortunado was created by gamers for gamers. That’s why it is commonly used for gaming blogs and web portals. There is enough space for small and big pictures, long descriptions and short acute excerptions. You can even demonstrate new trailers by placing them into a single block in just one click. 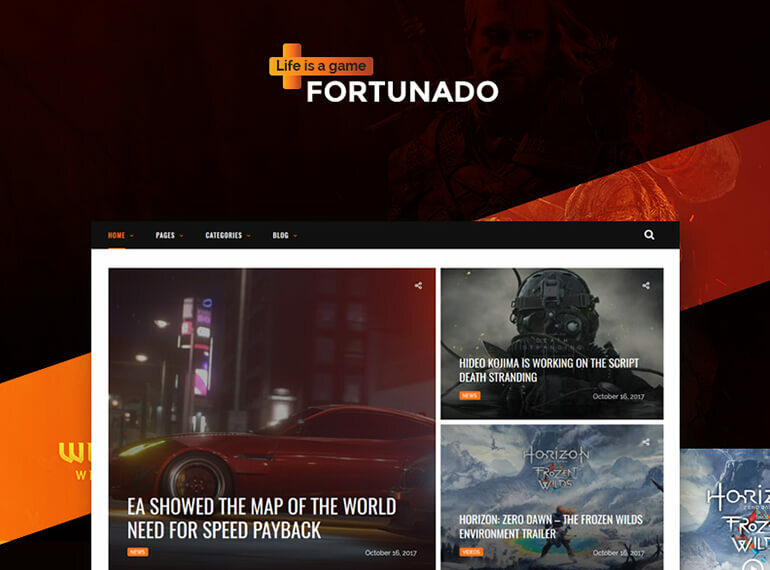 Fortunado is a fabulously powerful and colorific WP gaming theme! The Voyager theme is a #1 choice of travel-bloggers with preset plugins for a better photo exchange. Central carousel + 1-2-3 columns to place the newest photos all around the world. 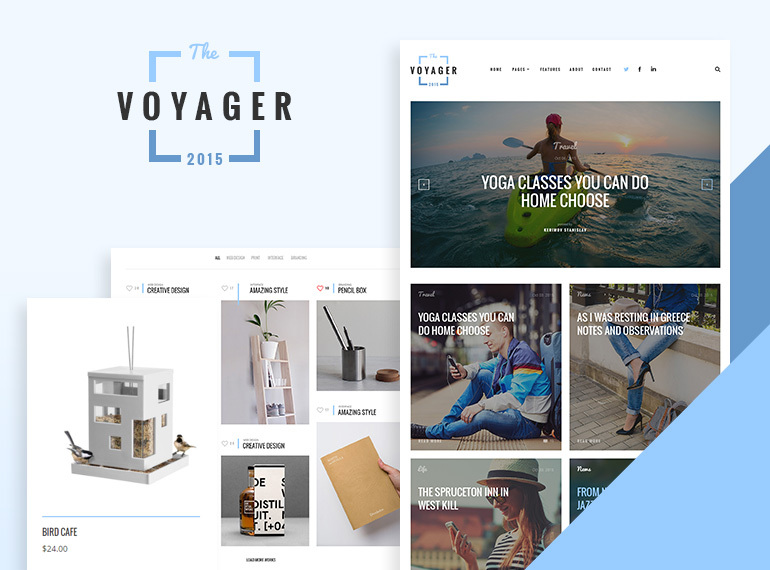 The Voyager WordPress template makes it easy to whack up photos and emotions. Notice the pretentious font of the category names that is placed over the images! Cook Traveler – we bet you know the subject of this template! No, it’s not only the trips to describe. It’s time to translate your fantasies into reality by mixing the content boxes in every possible way.